I’m happy to report that The Beauty of the Fall won the #RBRT 20117 Book Award for General Contemporary Fiction last night. A big thank you to all of you who voted. You can see all of the award winners by clicking on the link below. I hope you all have a wonderful holiday. 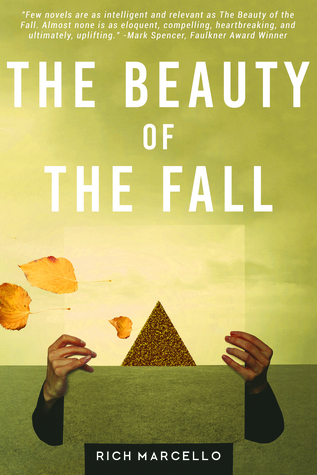 In Rich Marcello’s new novel, The Beauty of the Fall, Dan Underlight, a divorced, workaholic technology executive, suffers lingering grief over the death of his ten-year- old son, Zack. When Dan’s longtime friend and boss fires Dan from RadioRadio, the company that he helped create, he crashes and isolates himself. Willow, a poet and domestic violence survivor and advocate, helps Dan regain his footing. With her support, Dan ventures on a pilgrimage of sorts, visiting Fortune 500 companies to flesh out a software start-up idea. When Dan returns home with a fully formed vision, he recruits the help of three former RadioRadio colleagues and starts Conversationworks, a company he believes will be at the vanguard of social change. Guided by Dan’s generative leadership, Conversationworks enjoys some early successes, but its existence is soon threatened on multiple fronts. Will Dan survive the ensuing corporate battles and realize the potential of his company? Or will he be defeated by his enemies and consumed by his grief? This captivating, idea-driven novel appeals to readers who are interested in exploring a technology based solution to many of our current social problems, and to readers who are interested in father-son relationships, gender equality, and working through grief. Rich is a poet, a songwriter and musician, a creative writing teacher, and the author of three novels, The Color of Home, The Big Wide Calm, and The Beauty of the Fall. As anyone who has read Rich’s work can tell you, his books deal with life’s big questions: love, loss, creativity, community, aging, self-discovery. His novels are rich with characters and ideas, crafted by a natural storyteller, with the eye and the ear of a poet. For Rich, writing and art making is about connection, or as he says, about making a difference to a least one other person in the world, something he has clearly achieved many times over, both as an artist and a teacher. I won this in December from a Goodreads.com giveaway and if you read my monthly reading posts you know I started this book back in February. It was difficult to get into the story, but once I did it was wonderful. It reminded me of Zen and the Art of Motorcycle Maintenance. While I found of the technology details tedious the insight into Dan’s grief was interesting and poignant. If you are feeling philosophical about life (or want to feel so), I recommend reading this book. Dan Underlight, a divorced, workaholic technology executive, suffers lingering grief over the death of his ten-year-old son, Zack. When Dan’s longtime friend and boss, Olivia Whitmore, fires Dan from RadioRadio, the company that he helped create, he crashes and isolates himself. Willow, a poet and domestic violence survivor, helps Dan regain his footing. With her support, Dan ventures on a pilgrimage of sorts, visiting Fortune 500 companies to flesh out a software start-up idea. When Dan returns home with a fully formed vision, he recruits the help of three former RadioRadio colleagues and starts Conversationworks, a company he believes will be at the vanguard of social change. Guided by Dan’s generative leadership, Conversationworks enjoys some early successes, but its existence is soon threatened on multiple fronts. Will Dan survive the ensuing corporate battles and realize the potential of his company? Or will he be defeated by his enemies and consumed by his grief?